Since I got my Android phone, I've been using Google Listen to listen to podcasts. I really liked this solution since adding another podcast to my collection was as simple as adding it to my 'Listen subscriptions' folder in Google Reader. All from within my browser, all at the click of a button. Awesome. Listen may not have been the best podcast player - it didn't let you speed the playback up and didn't have a sleep timer. But it was simple and worked. Pity it was discontinued last year. Go to Pocket Casts settings and select the Import & Export option, then click on the 'Import OPML file' option and let it do its stuff. I really would like it if they had a web interface where I could add and manage subscriptions as easily as I did with Reader - hopefully they'll get there. To get the subscribed podcasts to automatically download, I had to create a playlist, containing All Podcasts, with 'Auto Download' and 'Only on WiFi' selected. For RSS consumption, I'm trying Feedly - so far I'm impressed by the presentation and its across all of the platforms - web, Android and IOS. Know How podcast Episode 35 has some good tips on organizing your photo collection. My problem was that I had EVERY photo I'd ever taken over the last 12 years! I've never deleted anything - or looked at them. I've backed them up on to 8 BluRay Discs so far. So I needed a way to shrink my collection to a manageble, share-worthy collection. This isn't a one day job, more like something thats going to take months - so I wrote a program that would index my collection, identify duplicates, and let me step through the unique photos one at a time and tag the good ones - then I can export to a date based folder structure. Now my collection is a more reasonable size, and structured well on the disk - I'm exporting it as I go, and loading it up in Picasa and sharing on Google+. BTW, if I exit the app, when I reopen it I can continue from where I left off. I've got over 50000 photos, turns out nearly half are duplicates, but I'm over 20% of the way through my collection and my family are finally getting to see the photos! 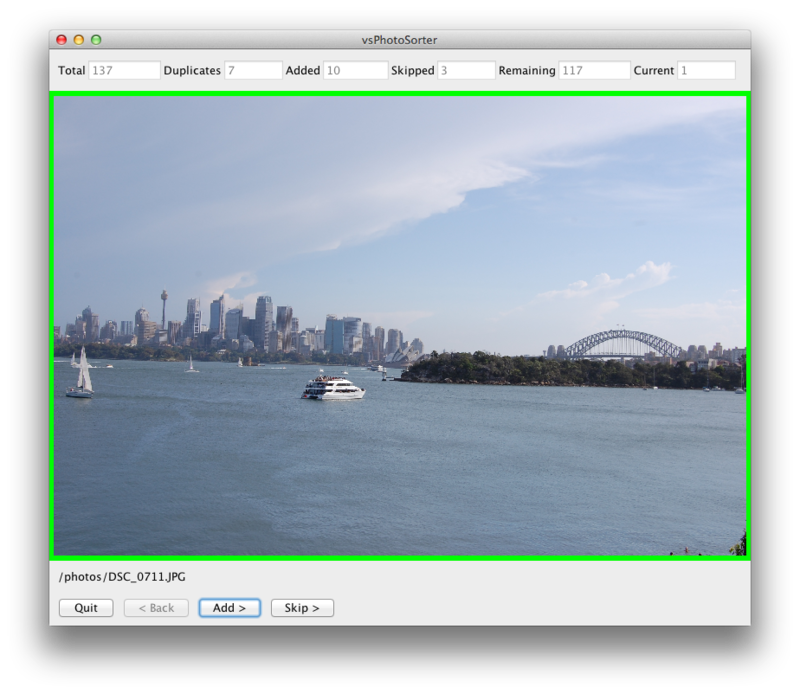 PhotoSorter 0.4 is now available. Let me know if you find this software useful, and discuss it on the group. Please note that in addition to the discussion group, you can raise bugs and feature enhancements here. If you want to know more about vsConsole, please see http://vs-console.appspot.com/. vsConsole is a tool for developers and testers which lets you easily tail log files on remote servers, monitor the status and version of applications deployed to your environments, and stay informed with broadcast messaging. Read more. I've just uploaded PhotoSorter 0.3. When the application starts, it will ping me with a unique installation id and the PhotoSorter version. This will let me know if this software is being used, so I know how much effort to put into it. Issue 7. Photos with a file path that contains "/Data.noindex/" will be ignored when importing, and if you already have imported them (using 0.2) they will be deleted from the index when the application starts. Issue 3. I had this problem - 10 years of photos I'd never looked at or sorted through. Sometimes I'd copied the same photos multiple times because I wasn't sure if I'd already got them. So I needed a convenient way of going through them - one by one, flagging the good ones, skipping the bad ones, eliminating the duplicates so I'd be able to export the ones I liked and share them with my family. Import directories that contain your photos - these directories are recursively scanned and each photo is added to the database. Duplicate photos are identified so that you'll never see the same photo twice. Now, you can step through each photo one at a time - either adding the photo to your collection or skipping it. You can quit at any time, and come back and continue from where you left off later. If you copy more photos off a camera into one of the directories you imported, you can re-index the directories and they'll be added to the database. The original images are never altered or touched in any way. Now you have a directory full of photos you like and want to share with your family or the world, or tinybeans, or facebook or picasa or flickr. Maybe you want to use those pictures as your screen saver - whatever, these are the photos you want to back up. If you have the same problem as me, take a look and see if it helps you. vsConsole 2.0 is now available for download. This version includes a much nicer user interface thanks to MediaLoot, and adds new features for monitoring web applications and messaging. Got a problem software can solve? Vamonos Software wants to create simple, easy to use software to help people be more productive and save time. If you have a problem that could be solved in this way, please discuss it on the group forum. Do you have years of digital photos just sitting unsorted on your disk? Would you like to quickly and easily sort out the good photos from the not-so-good photos? vsConsole is a tool for developers and testers which lets you easily tail log files on remote servers, monitor the status and version of applications deployed to your environments, and stay informed with broadcast messaging. Having trouble accessing log files?